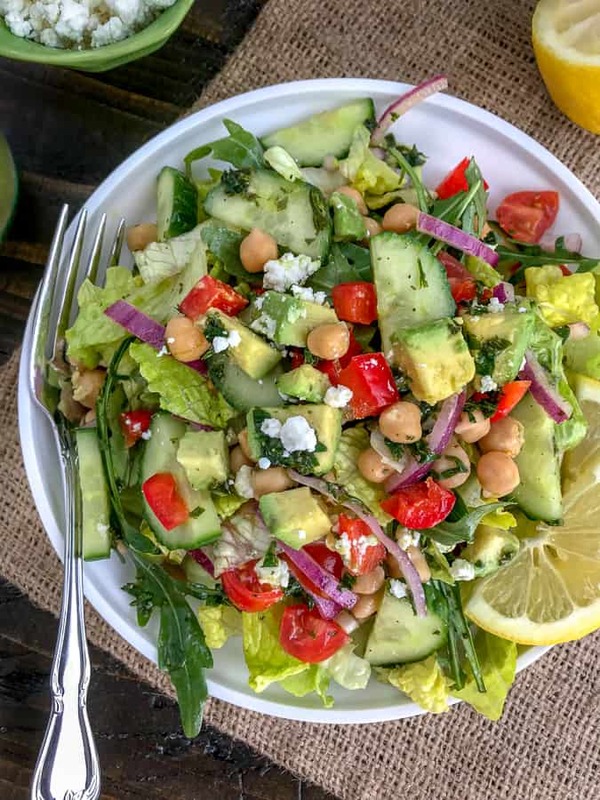 This Easy Mediterranean Chickpea Salad is a simple and quick meal option that is loaded with flavor from the garlicky lemon dressing to the crunch of the red bell pepper, onion, and cucumber. All tossed with arugula and chopped romaine for a hearty, meatless meal. 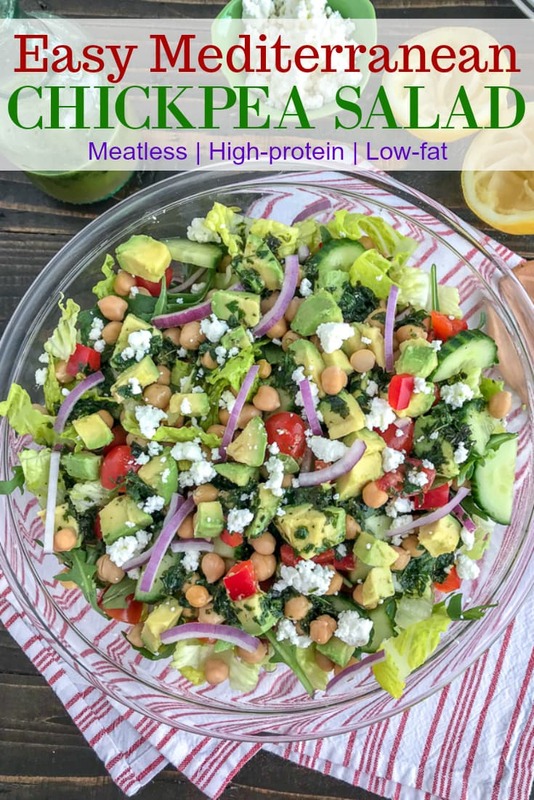 This salad is low in fat, high in protein and an incredibly delicious power salad that will help keep you feeling full and satisfied! 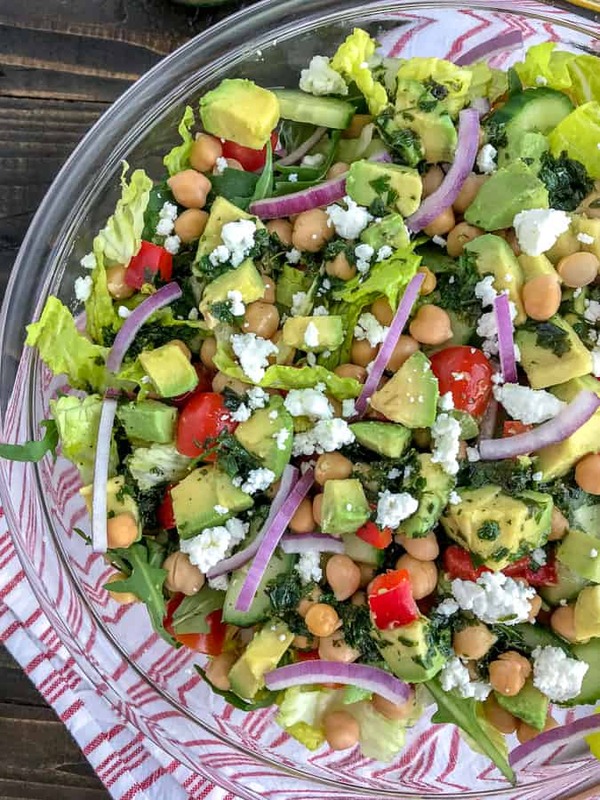 What I love most about chickpeas is that they are a great, healthy protein-packed vegetable that you can easily swap the meat out for in a salad. They require no cooking or effort. Simply drain, rinse, and toss with the salad. And that is what you’re going to love about this salad – it’s simplicity. It comes together in no time and with an abundance of flavor. Best part? 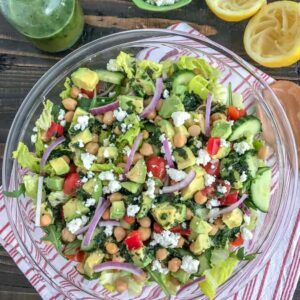 This salad keeps for several days! Which makes it a great meal prep option for lunches. Eating real, whole foods doesn’t have to be a boring affair. Not when they are tossed in a homemade garlicky-lemon vinaigrette and garnished with diced avocado and goat cheese. YUM! Traditionally, Mediterranean salads come with olives, but being that I am not a fan of olives I chose to omit them. My husband on the other hand absolutely loves them and enjoyed this salad in his lunch with them added. Don’t get me wrong, I have tried olives numerous times and in various ways; black olives, green olive, stuffed olives, olives on pizza, cooked with chicken, etc. I just can’t bring myself to like them. They say your taste buds change every 7 years and I believe that. There are many things that I have introduced into my diet that I enjoy more now than I did several years ago. Olives on the other hand? I simply cannot like them. So if you are, in fact, one that can stand those little buggers – my husband does recommend adding them to your salad for an extra punch of flavor. I recommend using fresh parsley and basil, as the flavor will be much more prevalent than using dried. 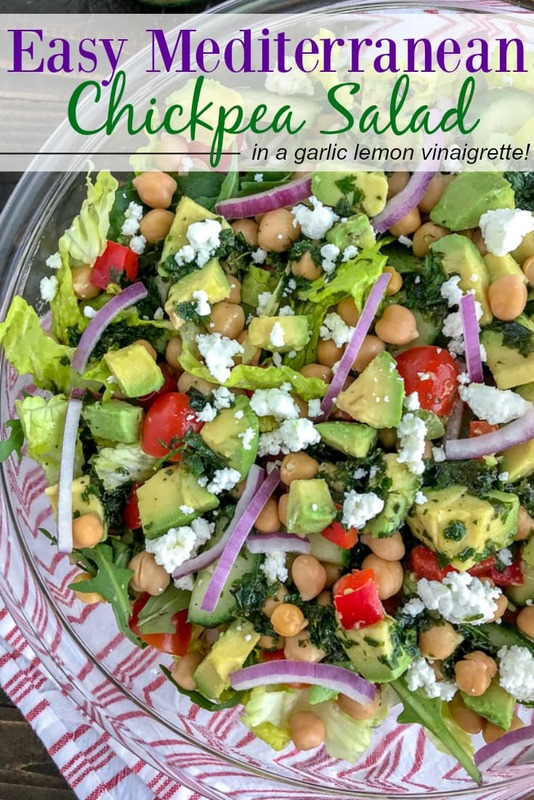 I would even recommend using the lightly dried parsley and basil for this, which is what I used and have on hand at all times. When choosing an avocado, check the stem. If it’s green and the avocado as a whole is soft, yet firm, when squeezed – it’s perfect! If the stem is brown and it’s very soft, it’s beyond ripe. I recommend adding the avocado right before eating. Toss the salad in the dressing as you eat it to ensure the vegetables don’t get soggy after the first 1-2 days. You can also squeeze fresh lemon juice over the diced avocado to help it keep from turning quickly. If you don’t have all of the vegetables on hand, then add in the ones that you do! This recipe is so versatile. Substitute any vegetables for the ones you have on hand or enjoy most. Red bell pepper for green bell pepper, cucumber for zucchini squash, red onion for yellow onion, etc. Feta cheese can be used to substitute the goat cheese. 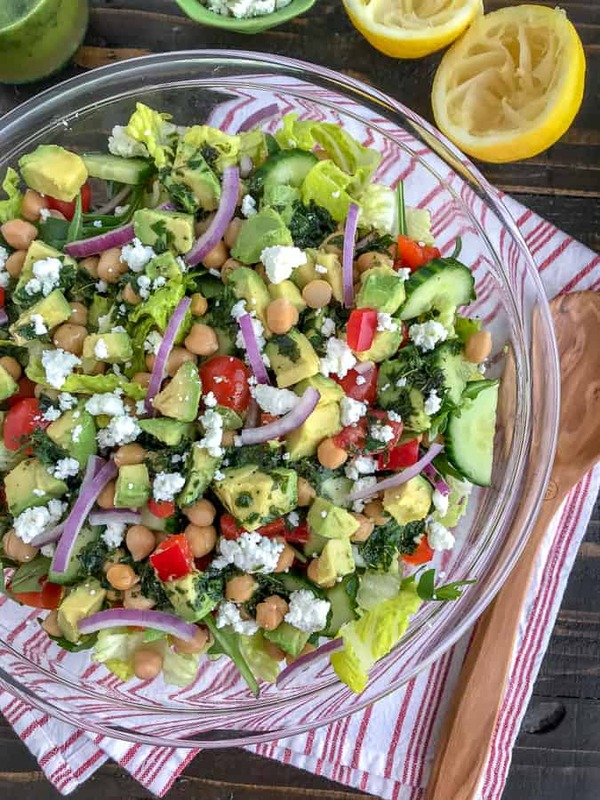 A delicious low-fat, high-protein salad that comes together in minutes. No cooking required! Cucumber, bell peppers, and onions tossed together with arugula and chopped romaine in a homemade garlicky, lemon vinaigrette. Perfect meat-free meal! Place diced avocado into a bowl and squeeze 1/2 a lemon over the top and season with a pinch of salt. Stir to combine. To a large bowl, add all salad ingredients and toss to combine. In a 4 cup glass measuring cup, combine all ingredients for the dressing. Whisk together to thoroughly combine (see notes below). Season with salt and pepper, to taste. Pour dressing over salad, toss well to coat. You can serve it immediately or allow the ingredients to marinate in the fridge for 1-2 hours. 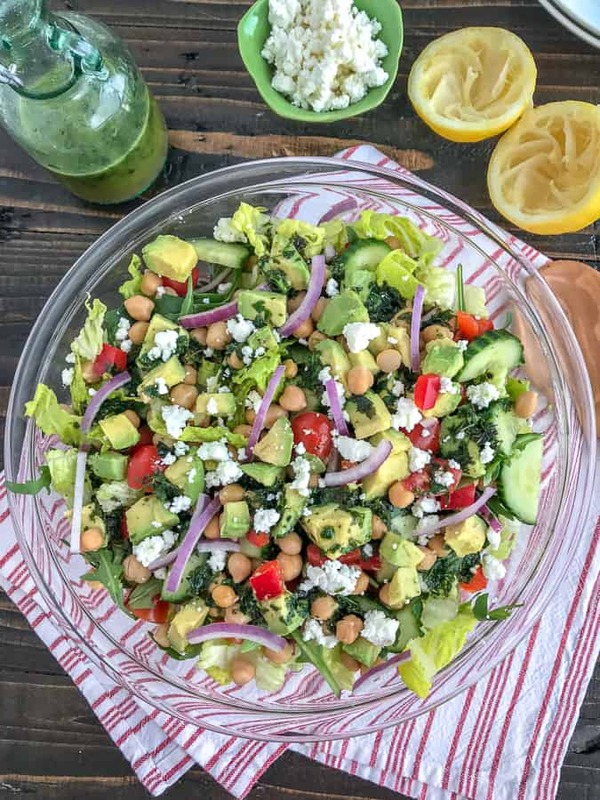 I would recommend adding the romaine and arugula separately if adding the dressing to have on hand in the fridge for a few days. Dressing: The dressing ingredients will settle to the bottom quickly. Give the dressing a good stir or shake to mix before adding to your salad. - A lot of the liquid components of the dressing will end up at the bottom of the serving bowl as it sits. I recommend tossing it before serving. Avocado: If ripe and with lemon juice and salt, this will keep for 1 day in the salad. I recommend adding it before eating for maximum flavor and freshness. Herbs: 1 tablespoon of lightly dried herbs equals 2 tablespoons of freshly chopped herbs. If using dried herbs instead, 1 tablespoon of fresh herbs is the equivalent to 1 tsp of dried.